For just $50 for a 2 year membership you can save on accommodation (10% up to $50) at more than 270 Discovery Parks and Top Parks in the most sensational locations across the country – from outback, beach, mountains, city, to wine regions, and more. And travelling has just got more rewarding. 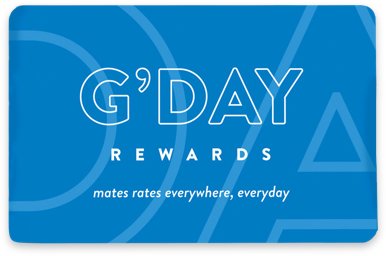 G’DAY Rewards is looking after our mates with new in-park benefits and exclusive deals through partnerships with trusted brands, providing everyday discounts. The more you stay, the more you earn – become our mate today! within a 12 month period. Terms & conditions apply. ^Subject to availability. #20 nights must be split over 2 separate stays. What are the benefits of a G’DAY Rewards membership? 10% off up to $50 per stay when you book at any Discovery Parks or Top Parks. You’ll also receive exclusive in-park benefits and everyday discounts on flights, travel experiences, motoring and retail Australia wide. How do I redeem my benefits in-park? Just make a request for your choice of bonus (bag of ice, early check-in or late check-out) when you book online or over the phone. It is recommended that you contact the park prior to arriving to reconfirm early check-in requests. Free equipment hire can be arranged at reception when you arrive at the park. *Some benefits are not available at all parks. If this is the case when you visit a park, we will do our best to accommodate you with an alternative benefit. What happens if I have an existing Top Parks and/or Discovery Parks membership? We’ll be sending G’DAY Rewards membership cards to all existing Top Parks and Discovery Parks members with information on the new program. You will still have access to your existing discount cap for the remainder of your membership. If you have both, your membership has been extended by two years. I would like to become a member of G’DAY Rewards. How do I do this? You can join online by clicking here and following the steps. You can join by calling our Head Support Office during Adelaide office hours on 1300 061 811, or by visiting any of our member parks as you are travelling. You can purchase a replacement card for $5 from any of our parks as you are travelling around. My membership has expired – what options do I have? Calling our Head Support Office during Adelaide office hours on 1300 061 811. If you’re looking to hit the road soon and would like to renew your membership before you leave, you may renew your membership up to 3 months prior to its expiry date. What do I do if I am about to travel and haven’t received my membership card? If you have joined online, you will receive an automatic email with your membership card number. If your card hasn’t arrived before you travel, please take a copy of your membership sign-up confirmation email with you to show on arrival at a park. This will allow you to obtain your 10% discount (up to $50). You can update your contact details by clicking here or by calling our Head Support Office during Adelaide office hours on 1300 061 811. Can I list both mine and my partner’s name on the membership card? Yes, you can display both names.